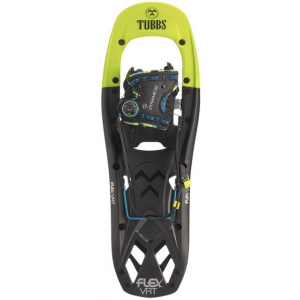 With lightweight and reactive Flex technology and custom-fitting BOA bindings, these Tubbs snowshoes perform as well in the backcountry as they do on packed trails. Unique Flex torsion deck enhances traction and comfort. Custom Wrap BOA bindings. Appropriate for most weights in packed and variable snow conditions. Works best up to 190 lb. in powder snow. ActiveLift climbing bar removes strain on the Achilles. Aggressive toe crampons. Curved carbon steel traction rails provides better grip on uneven terrain and hills. Flex tail allows more natural stride, reducing stress on hips, knees and ankles. 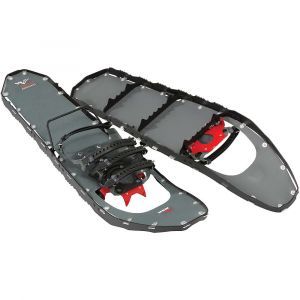 Unique torsion deck articulates and flexes based on the snow conditions, improving traction. Imported. 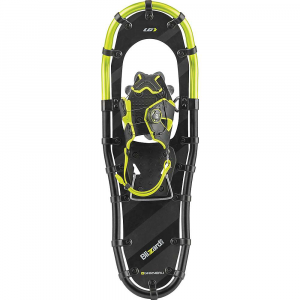 Built with a secure closure system, traction rails and patented Flex Tail technology, the Flex RDG Snowshoe is durable, responsive and can handle treks across a wide variety of mountain terrain. CustomWrap binding with Boa(R) Closure System offers exceptional precision with the twist of a dial. Rotating Toe Cord with Rotation Limiter allows the snowshoe tail to drop, shedding snow and reducing cardiorespiratory strain by 7%. Rotation Limiter prevents over-rotation. 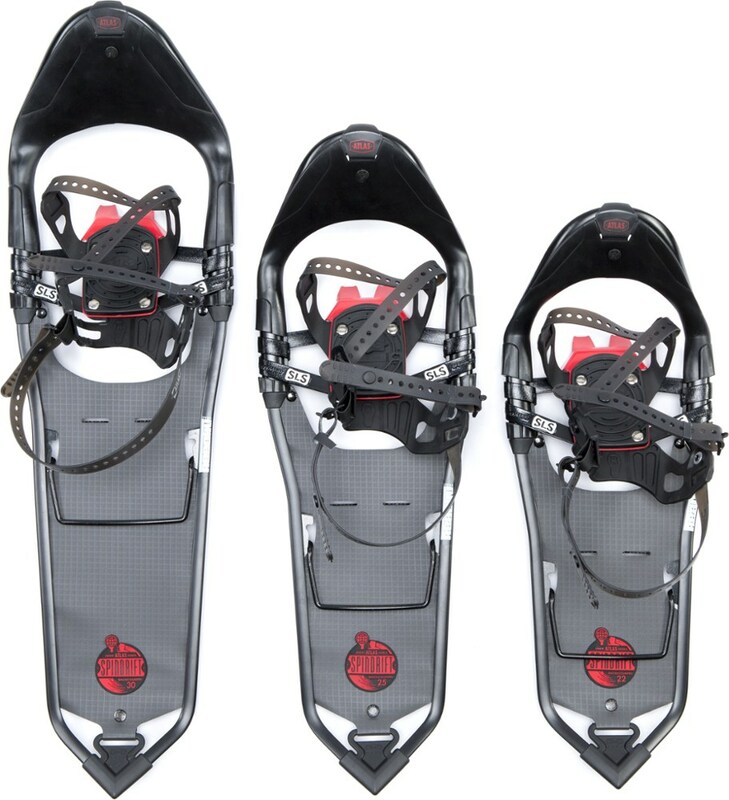 Patented Flex Tail technology allows the snowshoe to roll naturally from heel to toe. Flex Tail absorbs shock from heel strike, reducing stress on joints. 3D-Curved Traction Rails ensure superior sidehill grip in hardpack and icy conditions. Curved shape helps prevent fore-aft slippage on steeper terrain. 16 degree heel lift is ideal for moderate terrain and makes ascents easier by helping reduce calf fatigue and Achilles tendon strain. 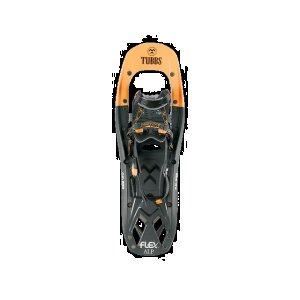 Torsion Deck allows torsional articulation throughout the body of the snowshoe, enhancing traction, biomechanics and comfort on uneven terrain. Imported. Tubbs Footwear Flex RDG Shoes - Men's 24 X180102001240. 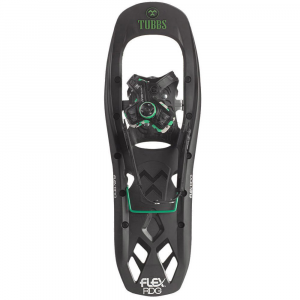 The FLEX RDG is the only Tubbs Day Hiking snowshoe that incorporates the heel strap right into the bindings construction to unlock exceptional full-foot precision with the simple twist of a dial. Designed to tackle a wide variety of all-mountain terrain, the new FLEX RDG (Ridge) features our easiest-to-use binding. The new CustomWrap(TM) binding with the Boa(R) Closure System is our only binding that incorporates the heel-strap into the binding's construction, creating exceptional precision with the simple twist of a dial. Weight/Pair: 3.9 lbs / 1.75 kg . Flex Tail . Torsion Deck . Rotating Toe Cord Rotation Limiter . Custom Wrap . Traction Rails.